Pratt, who attends a church that—according to The New York Times—has links with Hillsong, addressed the statements in an Instagram story posted on Monday (February 11) displaying the picture of a sheep. “It has recently been suggested that I belong to a church which ‘hates a certain group of people’ and is ‘infamously anti-LGBTQ.’ Nothing could be further from the truth. I go to a church the opens their doors to absolutely everyone,” Pratt wrote. The Guardian of the Galaxy star did not provide specific evidence of the church’s inclusivity towards LGBT+ people, rather sharing his own experience with the Christian congregation which, he said, embraced him during his divorce from Anna Faris more than a year ago. “Despite what the Bible says about divorce my church community was there for me every step of the way, never judging, just gracefully accompanying me on my walk. They helped me tremendously offering love and support. 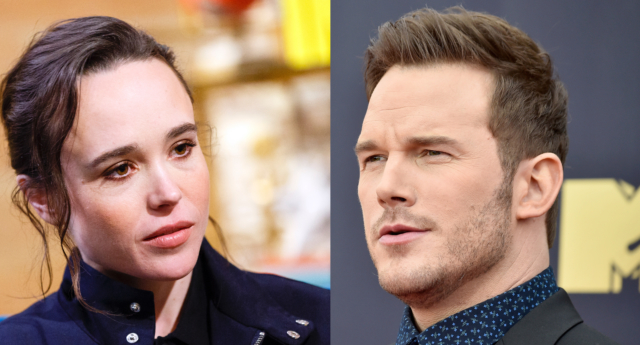 It is what I have seen them do for others on countless occasions regardless of sexual orientation, race or gender,” Pratt wrote. Page’s statements denouncing the Hillsong Church spurred from an interview Pratt did on The Late Show with Stephen Colbert on February 7 about being “inspired” by his pastor to perform the 21-day Bible-derived Daniel fast. The Hillsong Church was originally founded in Australia by anti-gay marriage pastor Brian Houston and has set up congregations in various countries such as the UK and US, where it counts several celebrities as members. The church has been accused of supporting the practice of gay conversion therapy, as reported by The Daily Beast,—which it appears to have disavowed in 2011. In his Instagram story, Pratt said his affiliation a certain church does not affect his personal beliefs. Pratt wrote: “My faith is important to me but no church defines me or my life, and I am not a spokesman for any church or any group of people. My values define who I am. We need less hate in this world, not more. I am a man who believes that everyone is entitled to love who they want free from the judgement of their fellow man.